Back in March of 2014, I delved into the world of a crazed gynaecologist and a psychologist trying to bring him down. The novel was Dark Whispers, a psychological thriller, and it was my first introduction to the work of South African author Joanne Macgregor. 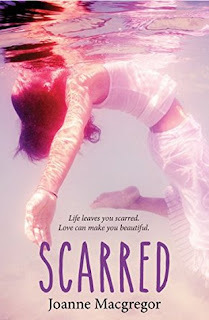 Recently, I had the pleasure of reading Joanne Macgregor's new novel, Scarred - a YA novel set in the United States and I am just going to come right out and say Scarred was an absolute pleasure to read. Also, Joanne Macgregor has a way of drawing you in from the first page with her writing (I felt the exact same way with Dark Whispers) - she made me want to find out more. Scarred tells the story of Sloane Munster who used to be THAT teen - popular, great athlete (a champion swimmer) and gorgeous. Until a tragic accident which greatly affects her. All that was BS (before scar). Now AS (after scar), in addition to many pills and regular visits to her psychologist, Sloane is also obsessed with tragic accidents. She follows the news about them regularly to make her self feel somewhat better about her situation - it could have been worse. Now starting her senior year in a new school, Sloane is prepared for the worst - stares, teasing and bullying from the other kids. As the accident, well, left her scarred. Scarred is as much about physical scarring - Sloane was severely injured in the accident leading to critical damage not only internally, but also a scar on her face which makes her extremely self conscious so she tries to hide behind tons of make-up and her hair - as it is about emotional scarring. Unable to swim again (competitively) and dealing with the consequences of the accident, Scarred reveals the scars we cannot see, which usually causes us even more pain. Scarred is also about love, but not the gooey teen romance, but a quite mature love that requires forgiveness. This is where Luke Naughton comes in - super hottie swimmer who Sloane had a serious crush on before the accident (when she was still swimming competitively in her other school). Now in the same school, Sloane cannot believe her luck. That is until Luke - who she thought might be different - gives her this look of disdain when she first walks into class on her first day of school (vain much, Luke. Here, I was rooting for you). Looks, however, can be deceiving, and one of the ways in which Scarred works is that we are not left to wonder only from Sloane's perspective what that look could mean. This is because with time we learn that Scarred is also told from Luke's perspective. Luke himself is actually more complex than you would imagine and is not just another pretty boy (he volunteers at an animal shelter for one). While Sloane is clearly the main character and we hear more of her; plus understandably, the accident has preoccupied Sloane's entire being (both physically and emotionally) since it happened. Yet, from Luke's perspective we learn that scars can run deep, and that more than one person has been scarred in this novel. Finding love, when you think you can no longer find it because physically you don't find yourself attractive or worthy emotionally is one thing. Finding love in the most unexpected place, or to be more precise with the most unexpected person, is a whole 'nother battle. Joanne Macgregor reveals the complexity of teen love and the maturity in both Sloane and Luke, especially based on the history their potential relationship is based on. As young as they are (seventeen/eighteen), these two characters showcase a level of maturity people 10, 20, 30 years their age may not necessarily have. Another thing about Scarred is that it manages to reveal scarring in other characters in the novel - from Luke's family to another character, L.J - who like Sloane is the subject of school bullying. While Sloane is a very brave and confident girl (although she herself does not believe she is) and can handle the teasing and bullying, L.J clearly cannot. Kids really can be cruel and he reveals in a quite scary manner the impact bullying can have on young people, especially if they do not have enough support at home. I may have started off reading Scarred thinking it was about the pain of Sloane, but the more I read, the more I realised we are all in pain in one way or the other - Sloane's was just more obvious and sometimes the visible scars are better as you cannot run or hide from it. It is the invisible ones that if left to fester can lead to some unintended negative consequences. Joanne Macgregor has written another beautiful novel, and while it is YA and readers of contemporary YA would enjoy this, I think its message cuts across ages and older readers could certainly relate to it.